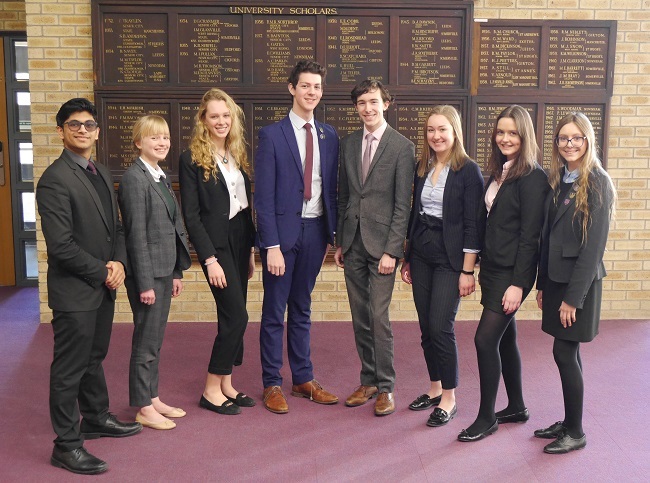 The Oxbridge interview process is famously challenging; nonetheless nine students from The Grammar School at Leeds (GSAL) have come through with flying colours. Three aspiring doctors have been offered places to study medicine at Cambridge – Julia Fierek is holding an offer at St John’s College, Emma Johnson at Jesus College and Lucas Hutchinson at Gonville & Caius College. Already taking French and German for A-level, Sam Kunin has opted to add another language to his portfolio. He has a place at Clare College to read Asian and Middle Eastern Studies, and will be learning Chinese from scratch. Two students are holding offers to study at Queens’ College, Cambridge – George Foster for natural sciences and Phoebe Brown for human, social and political sciences. Saurav Prakeerth is also bound for Cambridge, with a place to study engineering at Homerton College, and Anna Tinsley hopes to study land economy at Pembroke College, Cambridge. Harriet Blackman has an offer to study English at Lincoln College, Oxford. GSAL provides a comprehensive programme of support for students in sixth form as they apply for university. There is a dedicated Oxbridge coordinator to provide specialist advice and help on different aspects of the process, and the students find their mock interviews particularly useful. The students have one final challenge to meet before their places are confirmed, as the offers are conditional upon their results in this year’s A-level exams.